Leo Hsu reviews Keily Anderson-Staley's new book "On a Wet Bough". A portrait can make us believe that we know something essential about a person, even though we can claim no specific knowledge about them. Does seeing the particularities of a stranger’s appearance allow that person to seem less of a stranger? Can detail and articulation realize the full form of an individual? Or does such information reveal anything at all? Keliy Anderson-Staley’s tintype portraits in On a Wet Bough call forth such essential questions about portraiture. An image like Elizabeth, 2012 indicates the wholeness of the subject even as she appears in complexity, defying the viewer to make a judgment. All we can do is to acknowledge her, and the book imagines the good world in which people can be acknowledged: complete and yet incompletely known. On A Wet Bough presents 85 contemporary tintype portraits made by Anderson-Staley between 2004 and 2014 using the 19th century wet collodion process. With the exception of a pair of portraits of couples, each image is of a single individual, in nearly all instances looking intently into the camera lens. The plates in the book are photographs of the tintypes, which are unique objects. The reproductions are wonderfully luminous and satisfyingly large, but even so they do not entirely capture the visual quality of a tintype as light changes across its surface. In practice the subject sits before a large format camera, and a photosensitive plate is prepared, exposed and developed on site and immediately. The emulsions are slow and the plates are large, allowing for a grainless appearance, but also demanding a long exposure and a certain degree of concentration on the part of the sitter. The subject’s microkinesics - those tiny, unconscious movements of facial muscles through which others interpret emotion - are captured in the image and the resulting countenance is a held position that is unfamiliar as an expression in everyday interactions, a kind of attentive presence that is defined by an absence of ready cues for interpretation. Anderson-Staley’s sitters appear unreadable but not ambiguous, and self-aware. Many of Anderson-Staley’s portraits are made with a very shallow depth of field: her subjects’ eyes and lips are sharp, their faces extraordinarily detailed, the clarity demanding attention. Below and above the plane of focus, the sitter’s head, body and nose quickly fall away into softness. At the same time, many of the plates find their surfaces marked by practices and artifacts of the wet collodion process, intentional ones like the economizing “short pour” that produces rounded edges across the upper corners of the plate, and serendipitous ones like the marks of liquid striations around the edges of the plate or on the surface that evidence the tension between the chemistry and its metal support. The coinciding clarity of the plane of focus and the surface of the plate create an uncanny effect: the subjects of the portraits appear to be emerging forward into the surface of the image. This sense of arrival is reinforced by the rich tonal progressions and grainlessness of the image. In images like Reine 2004, a young woman seems to be actually materializing, coming into existence by virtue of being photographed. In Charles, 2011, a man presents himself, his face filling the frame, suggesting the fullness of his being. He appears powerful; even the uncertainty in his eyes (is it sadness?) feels like strength. Yet in the 19th century when collodion processes were widely used, neither of these qualities, the shallow depth of field and the residual artifacts, would have been desirable and either might have led to a plate being considered a failure. In the 1850s-1870s when tintypes were at the height of their use, clarity and sharpness were among the qualifications for a successful commercial portrait, along with the conscious and unconscious poses and affectations that combined to produce a portrait appropriate to the subjects’ station. More authorial photographers might have moved closer to their subjects and experimented with different compositions, perhaps evoking mythology or playing with presentation, but in portraiture this would have been the exception, not the convention. 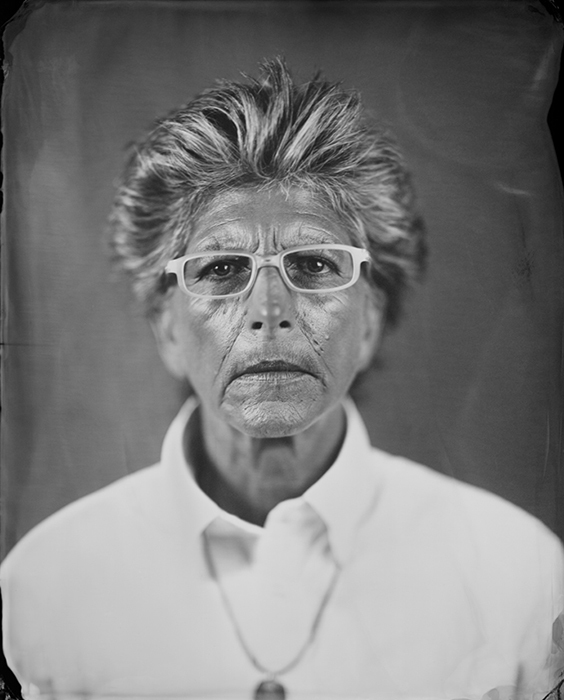 Anderson-Staley has worked the mysteries of both the portrait process and the tintype process into and through one another to the point that they can no longer be untangled. That is: she makes contemporary portraits with a 19th century process, but composes and frames her subjects in a 21st century manner; she embraces the fine resolution and tonal character of the process but also enjoys the unpredictable aspects of the collodion process, creating space for fortuitous accidents. The portraits are, to me, defined by the relationship between the long exposure and the still absence of marked expression. Perhaps Anderson-Staley is playing also with the possibility that our experience of looking at old pictures has allowed us to associate the tintype look with the never-truly-knowable past. The tintype “look” has come to signify unknowable distances, a filter through which any reading of the subjects must pass. I find these images beautiful and also unsettling: I feel confronted by her subjects and yet know little more about them after staring at them staring back at me. Their beauty and their mystery are wholly entwined, and that is certainly a pleasure of these images. But the assertion that each subject simply exists- known or not, knowable or not- is the real power and provocation of this body of work.